Get in, get out, and take the cash home. 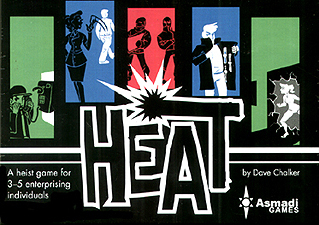 Heat is a quick 3-5 player heist game, where your goal is to steal more things than your fellow entrepreneurs, and at the same time avoid drawing too much heat from the authorities. Before every heist you'll draft cards to form your plan, and then execute it. Outmanoeuvre your opponents, and you'll be well on your way to a suitcase full of cash!